Sorry for the recap delay. I had a death in the family and spent the weekend in Long Island for the funeral. I’m back now though! As Psycho-jo gets more adorable, Se-kyung falls further into the pit of evil. I see the impending train wreck of doom racing towards me and I dread it so, so, so much. 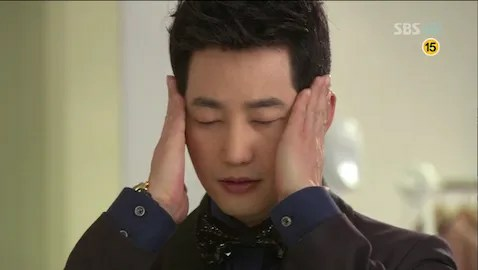 But Park Shi-hoo is so flippin’ cute as Psycho-jo that I bear with the pain just so see him giggle and smile. Se-kyung sits on a bench, as she is wont to do during times of distress, and distresses over the fact that she’s falling in love with Psycho-jo. Coach Tick just warned her that the first crisis on her road to Cheongdam-dong would be love and she’s hit it already. Se-kyung clutches her chest over her heart, wishing she didn’t feel as she did. At the same time, Psycho-jo clutches his chest, feeling the same thing, but he is so adorably happy. He twirls around trees, makes airplanes with his arms, and loves the feeling of falling in love. Min-hyuk, In-hwa and Daddy Cha meet to discuss “business,” but we all know that the potential in-laws are checking each other out. In-hwa suggests that Daddy Cha build shopping outlets on the outskirts of Seoul to bring in all the people who like to shop as part of an excursion: outings, leisure activites, amusement parks, movies, etc. Daddy Cha thinks she’s clever with this one-stop shop idea and she pretends to be modest. He offers to allow her to look for a potential site herself. Coach Tick remembers her encounter with Daddy Cha in Paris and asking to finish studying and for the recommendation letter. He asks if she really loved Psycho-jo and with tears in her eyes, she asks him how that is important now. You did love him! You DO love him! 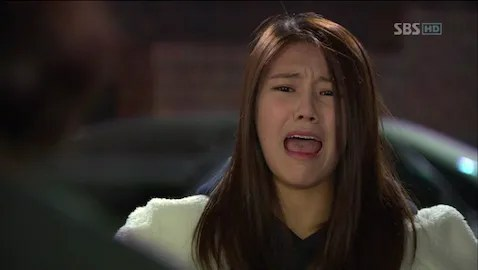 Se-jin tries to run away when her parents ask her to take some time off school to help pay for a class for their mom. Their parents think mom needs to get a job too to give them some financial stability. I think it’s a great idea; Se-jin is just being a baby and wants to do what her friends are doing. Se-kyung bribes Se-jin into accepting by promising a designer bag once her stylist’s job is done. Guh, I don’t like that kind of selfishness. I’m the oldest child, so I naturally sympathize more with Se-kyung, but can’t Se-jin help out? She’s just whined this entire time! I know, I know, things are hard. 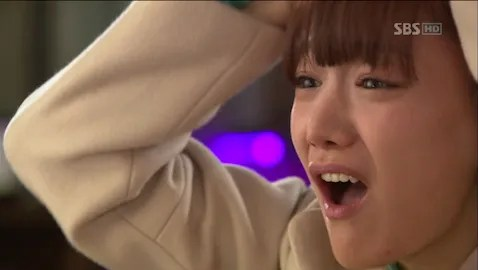 Se-kyung thinks that Se-jin is immature, but then scolds herself for allowing Psycho-jo to creep into her heart. Yeah, because falling in love is SO immature. Ah-jung drunkenly calls Se-kyung and invites her out drinking with Secretary Moon. She says that she’s gathering information on the president, because it’s weird that Se-kyung can’t meet him. 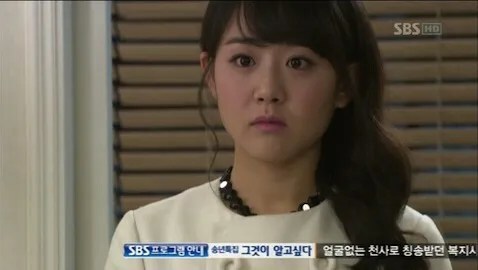 She also warns Se-kyung away from Secretary Kim. Apparently, Se-kyung only falls for pathetic guys. 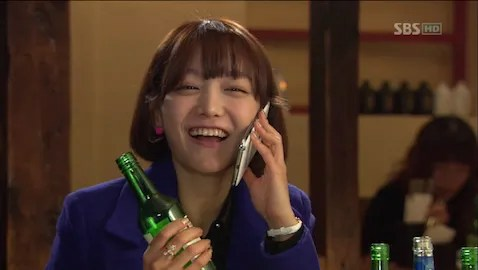 When they hang up, Se-kyung broods over the bow Psycho-jo gave her and Ah-jung and Secretary Moon play drunken truth or dare with a soju bottle. Se-kyung promises that a situation like In-chan would never happen again to her. Psycho-jo, in the meantime, declares that he never thought something like “this” (love) would happen again. He explains what happened with Se-kyung to Dong-wook (and acts it out with a cue) and laments how he couldn’t bring himself to “do it.” He touches his cheek and says it was because he was nervous. Dong-wook says it’s a good sign that his heart was able to develop such feelings. 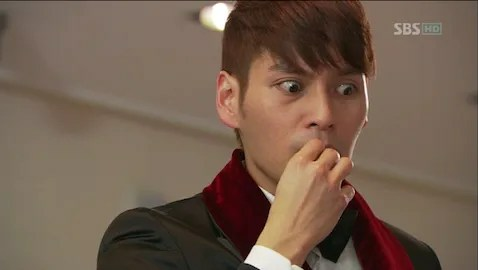 When Psycho-jo nervously asks what to do, Dong-wook advises him to just do it the next time he meets Se-kyung, even if he’s nervous. At first, Psycho-jo seems scared of the idea, then he sinks his eyes shut and practices puckering up with his cue. BWAHAHAHA! 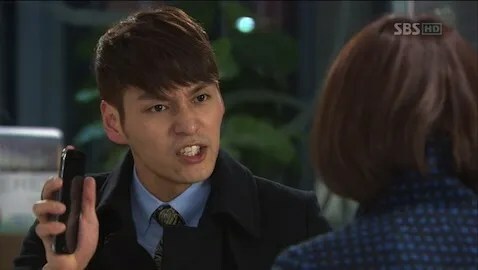 Dong-wook stops him from fantasizing and tells him to just do it, then come back and tell him all about it. You just want to hear the gory details! You are SUCH a guy. Se-kyung is reading Coach Tick’s Wonderland journal. It advises against everything involved with love. Business and love cannot be mixed because love clouds everything. At home, Psycho-jo listens to the “Love Affair” soundtrack, fake conducting in his chair. THEN HE PULLS OUT THE HAPPY BUNNY FROM UNDER THE COVERS! Yes! I am so happy. He’s conducting, singing and hanging out with a happy white rabbit! He dramatically declares love is worth all the danger it comes with and dances and sings all crazily. I think I’m in love, too. Then, he falls asleep hugging the White Rabbit and Se-kyung puts away her ribbon from Secretary Kim. The next morning, Ah-jung wakes up in a rush and informs Se-kyung that the president isn’t married and she should just go for him. Se-kyung thinks that is just being too greedy. Heh. She asks Ah-jung for the president’s schedule and wants Ah-jung not to be blabbing secrets here and there. That reminds Ah-jung that there is one more thing she wants to tell her, but she can’t remember what it is. She remembers fretting the night before but not why. Uh-oh. Did the drinking games go too far? Psycho-jo holds a meeting about the Christmas party but Secretary Moon isn’t paying attention. He is worrying about what he said to Ah-jung the night before. Ah-jung is worrying about what she said as she breezes by Psycho-jo in the hall. If she had been paying attention, she would’ve recognized him. Good thing she wasn’t. Oh yeah, we all know that both of them spilled secrets. Se-kyung meets Psycho-jo to go over the party outfits. She is uber depressed and trying not to be in love. He tries to greet her with a high five and is so cute and…she shuts him down by ignoring him! WAH! He tries on one of the concepts for the party and AWKWARDLY tries to get close to her to kiss her, but fails as she is sullenly trying to avoid him. WAH! WAH! WAH! He’s sooooo cute. She’s such a party pooper! He gives himself a mental pep talk and reminds himself that it’s all about the timing. *SQUEEEEEE* She has to remind herself to focus only on work and tries to leave. He stops her by saying he wants more styles and she agrees to have some more ready. Again, she tries to leave, but he calls in a bunch of people with some styling of his own: for her. He explains that the president dresses him and that the president likes his people to look uber fashionable. She gets dressed and steps out to Psycho-jo’s utter delight. Let me just say that Moon Geun-young has some KILLER legs. Okay, you’re being dressed in riches and you’re not happy. I think your plan is not going to make you happy, woman. I think the happy, grinning, love-sick puppy behind you will. Then he brings out some shiny stilettos and puts them on her feet despite her protests (a nice little Cinderella moment.) When she rises, her ankle collapses and she falls into his arms. The moment is seriously electric and Psycho-jo knows better than to waste it. She tries to pull away, but he brings her close and kisses her. When she comes to her senses, Se-kyung pushes him away and runs into the dressing room, trying to calm her rapidly beating heart. Outside, Psycho-jo paces anxiously, waiting to see her again and talk about it. She finally emerges and leaves before he can say a thing. He tries to go after her, but she catches a bus. He unhappily watches her leave. She unhappily watches a couple coo over each other on the bus. ACK! Me no likey tension. Ah-jung and Secretary Moon wonder what secrets they spilt. Finally, Ah-jung takes things into her own hands and invites Moon over to ensure that no secrets were divulged. She arms herself with bribery cakes and cookies. They awkwardly greet each other. 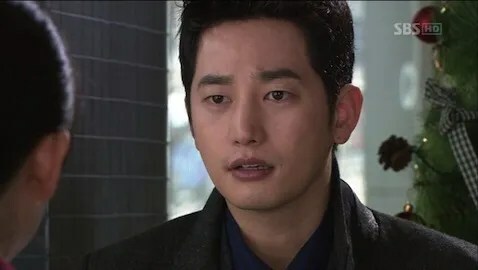 Ah-jung apologizes because he paid for all the drinks the night before and he freaks out that she’s a drink hog because it was so much money. This makes her happy that he doesn’t seem to remember anything. They awkwardly giggle over not remembering anything and share the cake, hoping that they won’t remember anything later. Poor, poor ickle Psycho-jo its bundled in his blanket, worrying about the kiss. Dong-wook says that girls don’t just immediately throw their arms around a man’s neck when he kisses them. Psycho-jo says he was drunk on his feelings and was too hasty. Dong-wook teases him for being over thirty and worrying about a kiss. But Psycho-jo is happy to be able to truly cry ,laugh, worry, feel anger and tension again. He didn’t think he’d be able to feel again. 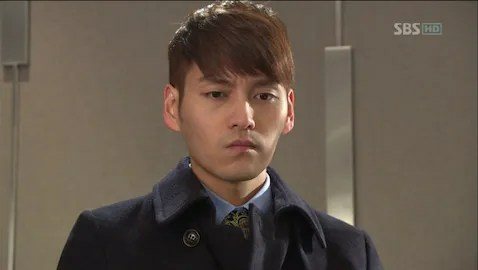 Dong-wook advises him to tell Se-kyung how he really feels. Meanwhile, Se-kyung throws away the ribbon Psycho-jo gave her and hardens herself, again, to love. She won’t be pathetic anymore, she promises herself. When Psycho-jo texts her about meeting the next day, she agrees to go with a renewed resolve. Tommy Hong receives an invite to the Christmas party and Se-kyung’s resume, but he’s mulling over the connections between Artemis, GN Fashion and Royal Group. It will be the biggest marriage-match he’s ever made and the biggest business union in Cheongdam-dong. The commission couldn’t be compared to anything he’s done before. He plans on getting his name as a sponsor for an Olympic line as a commission. That’s a big fish right there. He meets with Daddy Cha who is happy with In-hwa. But he wonders why there has been no word from Psycho-jo. Tommy Hong takes the moment to explain that Psycho-jo is not an easy person to work with and also reminds Daddy Cha that the sponsorships for the winter Olympics are about to be decided. No pressure, Tommy says, but it would be his honor to sponsor the uniforms and he’d work like his life was on the line for a small motivation like that. He wouldn’t dare to make a deal with Daddy Cha, but only ask for this SMALL favor. Guh, greasy, slimey business dealings. Ho-min wonders how long Coach Tick is going to avoid events like the party where Psycho-jo would come face to face with her husband. He worries she’s going to ruin him, too. Aw, that’s brotherly love. Coach Tick can’t handle this pressure. She’s already in the hospital for nerves. She kicks her brother out. Daddy Cha goes to the hospital to meet Dong-wook. On his way out of the hospital, Ho-min meets Min-hyuk and then sees Min-hyuk greet Daddy Cha. Apparently, this is bad and Ho-min calls to warn Coach Tick to leave the room. She hurries out and watches her husband and Daddy Cha walk towards her room. Daddy Cha decides to meet Min-hyuk’s wife under better circumstances and leaves to go to his previous appointment. Coach Tick has another breakdown in the stairwell and avoids her husband’s calls. She going through the call list and it’s all from her husband and brother. But then there is one from Se-kyung. She calls and has Se-kyung bring her clothes. I really love this frenemyship going on between them. It makes me hope that Coach Tick, who started Se-kyung on her path to evilness, will also be the one to stop her and steer her back towards Psycho-jo. It would be healing for all of them. Coach Tick could give back to Psycho-jo and Se-kyung. Se-kyung could see that Coach Tick, her role model, isn’t happy with her life and then Psycho-jo can get the girl. Anyway, Se-kyung wonders what’s wrong with Coach Tick but gets a vague answer. Coach Tick asks how Se-kyung is going to solve the first crisis and Se-kyung responds that she is going to do it face-to-face. How did Coach Tick get over the first crisis? Se-kyung wonders. Coach Tick tells Se-kyung to overcome it now or forever be shackled at the ankles. The second and third crises are also love. NO!!!!!!!!!!!!!!!!!!!!! My heart is breaking for uri Psycho-jo. For Se-kyung, too. But he’s just so raw and innocent. Se-kyung wonders how love became a crisis in her life and hung onto love. She saw that people like Coach Tick managed to live without love and thought that she could never be that way. But Coach Tick tells her that she isn’t the kind who can live without love. She just wanted to have a better life, just like Se-kyung does now. But it obviously came at a price that we don’t want Se-kyung to pay! If Se-kyung still wants that better life, she better take care of this first crisis right now. Psycho-jo is in his office practicing his confession. He is SO CUTE. No, no, no, no. I see heartbreak. It’s only episode 7. Don’t do this to me. Se-kyung waits for Psycho-jo and steels herself. He slides in the seat across from her and awkwardly greets her. His hands are fidgety as he tries to confess to her. At first I think she’s not going to stop him because she looks so touched and like she wants to hear what he has to say, but then she stops him. She doesn’t want to associate with the president through Secretary Kim anymore. She is thankful for his help, but this isn’t right. Psycho-jo looks really awkward and wonders if this is because of yesterday. What happened yesterday? she asks. What happened yesterday isn’t important to her. What is important to her is the president and his styling. Psycho-jo wonders if she doesn’t like him and her face as she struggles to remain cold is absolutely heartbreaking. She doesn’t want to do this to him. He wonders if she doesn’t like him, but whether or not she likes him has nothing to do with it, she replies. She and Secretary Kim are just in a working relationship. He says he got too immersed in his feelings and didn’t think of hers. Was it awkward working with him? She starts to say it had nothing to do with that, then admits that it was uncomfortable working with him. She is the president’s stylist and won’t continue to work without meeting him. WAAAAAAAH! His face is soooooo pathetic! She thanks him for everything and then leaves, silently telling herself that she did a good job. But she can’t stop herself from turning around and watching Psycho-jo hang his head, trying to come to terms with his broken heart. They remember all of their moments together and remind me that this whole thing is foolish and that they should just get together and make babies. Guh, the truth would be GREAT at a time like this. From both of you fools. But that’s asking too much this early in the drama. He gets up to go after her, but it’s too late. She’s gone. 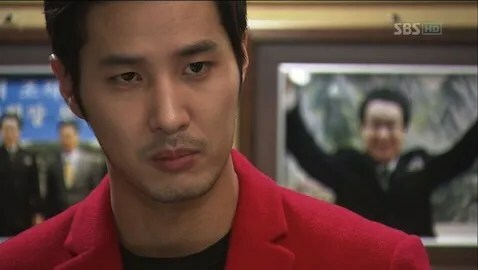 Psycho-jo is still reeling when he heads back to the office and asks Secretary Moon if he met Ah-jung. Moon wonders if Psycho-jo has heard anything, which makes the heartbroken puppy very suspicious. 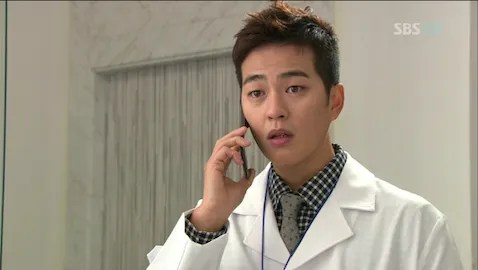 Moon admits that he can’t remember what he said to Ah-jung but he was sure it was a secret. Psycho-jo wonders if that’s why Se-kyung was acting strangely earlier. At the same time, Ah-jung admits the same thing to Se-kyung: she can’t rememeber what she said to Moon. She assures Se-kyung it wasn’t anything about the White Rabbit and that Moon doesn’t remember anything. But Se-kyung worries about when Moon does remember. Will he tell the president that she approached him purposefully? Psycho-jo calls Dong-wook and explains what’s happened. If Se-kyung finds out, she’ll think that he’s crazy. But you are, my cute little lovesick puppy! He admits that he couldn’t confess because she said she didn’t want to work with him anymore. If she finds out he’s the president, she’ll think he’s a psycho. Pffffffft. 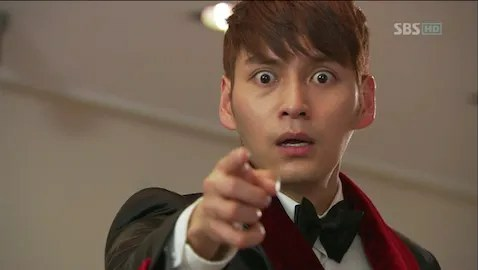 Dong-wook advises him to reveal the truth himself, before someone else does it for him. Wow, what a friend you are. You should’ve told him that a long time ago. The outfit Se-kyung prepared for him arrives and it’s the one he tried on with her. Tommy Hong goes to see In-hwa. They both confirm they’re going to the party and then Tommy jumps straight into business: he wants her to collaborate with him. She coolly agrees, understanding all that is at stake with the merger. She wonders how he’ll fix the relationship between father and son. He just advises her to keep business and marriage separate when dealing with Jean Thierry Cha. She guesses that stipulation has to do with JT Cha’s past and also wonders about the girlfriend she’d heard Cha has. Tommy assures her not to worry about it. Right now, I’d say he’s right. Jean Thierry Cha invites Se-kyung to the party as he gets ready with two rabbit paper clips in his hankie pocket and Se-kyung’s bracelet on his wrist. Se-kyung calls Ah-jung with the news and Tommy Hong overhears. The president sent her clothes to wear and Ah-jung assures Se-kyung that the president doesn’t know anything. But if the president hears the story before she meets him, everything will be over. Oh yay, Tommy Hong is going to interpret that all wrong, isn’t he? Ah-jung promises to remember what she said to Secretary Moon and makes Se-kyung promise to get positively noticed by the president at the party. Min-hyuk and In-hwa visit Coach Tick before they head out to the party. When they leave, she dresses for a little meeting of her own. Se-kyung dresses in the clothes she tried on with Psycho-jo and looks so depressed to be wearing an outfit that could probably pay her rent for a year. How is this a good plan if you’re mopey all the damn time, Se-kyung? Explain it to me. She gets all prettied up and looks so lovely except for the frown on her face. Psycho-jo has a frown on his face, too, as he drives to the party in his suit. Coach Tick meets with Daddy Cha, who recognizes her face. When she introduces herself as Seo Yoon-joo (Coach Tick’s real name, in case you’ve forgotten), Daddy Cha does NOT look happy. 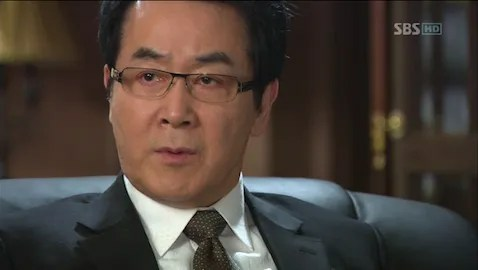 Secretary Moon is wracking his brain as the party is being set up and sees the bartender spinning a bottle, which partially brings back his memory. At the same moment, Ah-jung is spinning a soju bottle, trying to remember. They remember at the same moment and the truth of what they revealed is not good. Se-kyung sees a man wearing the outfit she choose and starts to follow him, hoping its the president. The elevator closes so she takes the opposite one. 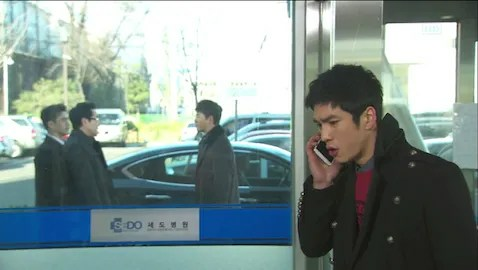 Psycho-jo steels himself to confess the truth and gets a call from Secretary Moon. 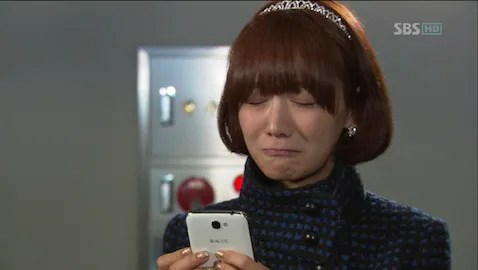 Se-kyung gets a text from Ah-jung. It’s not just what they said, but also what they heard from each other. Ah-jung says that Se-kyung likes Psycho-jo and Secretary Moon says that Secretary Kim is Jean Thierry Cha. Se-kyung and Psycho-jo glance up as the elevator doors open. So the secrets are out. Well, sort of. Let’s see what the start of the next episode does with them. You know how k-dramas love to tease. First and foremost, when I thought Psycho-jo couldn’t get any cuter, he DID. And then some. He’s like this little teenaged girl in love, running to his little girlfriend and then freaking out over every step in the process of love. It’s SO ADORABLE! Despite his deep wound, love has brought him back to himself: a lively, innocent, fun man who just wants to be happy and be with Se-kyung. Too bad Se-kyung is the picture of unhappy. I’m rather disappointed that I don’t love her character although I see why she’s doing what she’s doing and I understand her reasoning. When she’s honest, I enjoy her the most. I do think it’s interesting to have a female lead who is not good and perfect, especially when that’s the reason that Psycho-jo liked her in the first place: her work-ethic and passion. She’s utterly passionless now, save for her repressed emotions for Psycho-jo. She has one goal: marry into money to support her and her family so that she may never suffer at the hands of poverty again. It’s not a hateful goal, but the lies she has to weave to attain it are hateful. If she was honest, this would be better. But honestly in episode 7 of a k-drama is just not possible. I’m starting to love Coach Tick and her miserable life. I really hope she becomes the reason Se-kyung starts to pull out of this ridiculous plan. I hope she redeems her cruelty to Psycho-jo and Se-kyung by stopping the madness. It will also give her some closure and allow her to enjoy the life she has. Perhaps she is the Mad Hatter of the story? As for Ah-jung and Secretary Moon, I’m glad they were so adorable throughout the whole thing. I usually detest these secondary plot-pushing characters and the fact that their nosiness moves things forward. But this was kinda cute and it was well-established that this sort of thing would happen. Cheongdam-dong Alice Episode 7 Screencaps. I like PSH in Prosecutor Princess. I love PSH in Princess Man. I ADORE PSH in Alice!!! He’s absolutely irresistible here. Such a quirky mix of power , pompous ( but oh so CUTE!) panache & potent pretty! Absolutely worth every Swooon. I started this show largely for my top-o-d-heap kdrama actress , MGY but it seems , now , I’m watching it for PSH. Waiting wt bated breath for this wkend. This was the best of the two episodes this week. Seung-Jo? Why so cute?